Will McVay graduated from the University of Delaware with a degree in Computer Science and Psychology and a minor in Political Science. He has been endorsed by and is currently serving as the Vice Chair of the Libertarian Party of Delaware. He is currently running for this office as a Republican in the Republican Primary. Governor Johnson states, “Will McVay will be a strong and firm voice in the Delaware House of Representatives. He is a strong stand against handouts to big business, federal interference in education, and a strong stand for new businesses, educational choice and fiscally conservative, socially tolerant good government." Awesome! 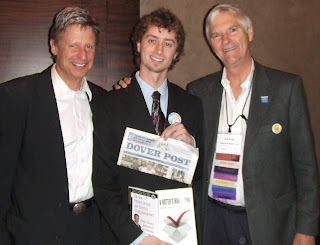 I like Gary Johnson. This is a good endorsement to get.